You download the MedAngel One App. You synch your sensor via Bluetooth. You are ready to start living with peace of mind by knowing that you will be notified if your medications are nearing or have reached an unsafe temperature. Insulin is EXPENSIVE. Insulin is not optional. Insulin has to be stored between the temps of 36-86 degrees Fahrenheit to stay potent. When I was first diagnosed 5 years ago, I was careless with my insulin. There were many times I forgot it in the car. I live in Arizona. Nuff said. Once I checked it in my luggage on a flight- bad move. The airline lost my luggage- worse move. So during all that time away from my insulin, I had no clue what temps it was in. Even just over the Easter holiday my husband accidently put my purse in the trunk of the car while we were driving from hot Palm Springs to hotter Phoenix. It was my first weekend trying out MedAngel and I got the alert on my phone that my insulin was getting hot! I told Kev to pull over and I was able to save my insulin from reaching unsafe temps! Thank goodness! It could have turned into another situation of wasted insulin but thankfully MedAngel did its job! You can save 20% with the code "GLITTER"
Before I shared my experience with you, I wanted to make sure that not only did it protect my insulin from the heat, but that it would also do its job in extreme cold. Since I live in Arizona and I mostly travel to sunny locations, I don’t ever worry about my insulin getting too cold. I am aware that many of my readers/followers/diabuddies live in cold climates and freezing insulin could be a real fear. I packed an expired bottle of insulin in my Myabetic with the MedAngel and put it in my freezer. I just waited and basically played the Jeopardy theme song in my head. It took a lot longer to drop from room temp to below 36 but as it was approaching MedAngel sent a notification to my phone! I was talking to my friend Diabetic Energetic and he told me that he keeps his MedAngel in the fridge with his unopened insulin to make sure it’s always safe! That convo reminded me of a time when I put my insulin in a mini fridge in a hotel and it froze! I’m currently cringing by thinking of all the times I ruined a bottle of insulin. Like I said earlier, I’ve needed a product like MedAngel since diagnosis. Plus not only does it alert you when temps reach unsafe levels but it also offers full insights of what has gone on the past 30 days via a temperature chart. There are so many different situations where MedAngel can come through and save the day. CLICK HERE TO SHOP & LEARN MORE! The sensor is priced at $49.00. 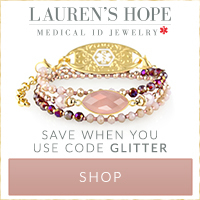 With my promo code “GLITTER” you can save 20% + free shipping! ​Once you get it please share the situations where it came in handy for you! Can’t wait to hear what you think! How do you keep your insulin at the right temperature when you are travelling, do you use a Frio?